Though there’s only a single transformer, separate windings supply each output (or output pair). My pedalboard seems to be in a permanent state of being rebuilt, and this time around I decided I needed a better power supply, as I was getting more low-level hum and whine than I was happy with. My existing regulated power supply was OK but all its outputs are essentially wired in parallel, and it was evident that some of my digital pedals were passing on noise to my analogue units via their common PSU connections. I also have one 12V pedal that has a centre-pin positive configuration, so I had to use its own supply... and that meant my old pedalboard also needed a mains distribution strip built into it. After looking at various PSUs, I decided on the Nemphasis Oktopus Plus, as it has nine fully isolated, centre-pin negative outputs, with the option of adjusting the supply voltage on all but three of them. All this comes in a robust, 300 x 157 x 46 mm aluminium case, which is strong enough to have pedals mounted directly on top of if you need to save space. Nine patch cables with Boss-compatible (2.1mm) connectors are supplied, as is an IEC mains cable. Inside the case is a substantial toroidal transformer, with separate isolated secondary windings for each of the nine outputs. 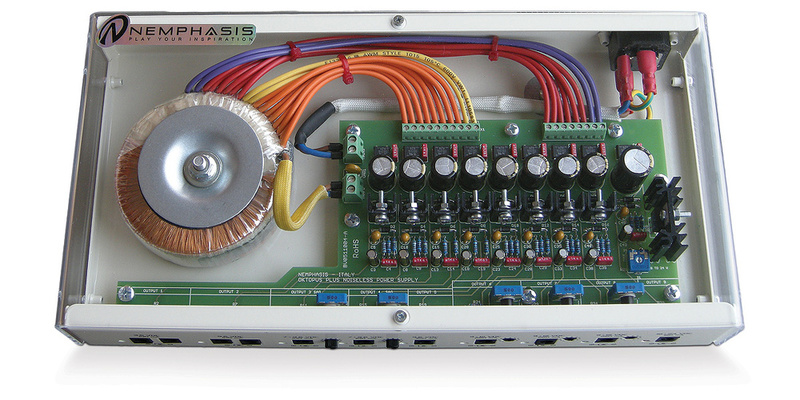 These feed into a line of individual rectifiers, smoothing components and voltage regulator ICs. Separate LEDs confirm that power is present on each of the outputs (which have overload protection), and on the European model I bought the power inlet accepts a nominal 230V AC mains supply. Outputs one and two have fixed 9.6V outputs (compatible with most pedals), while the next two can be adjusted using trim pots from 7 to 9.6 Volts, for those pedals that seem to sound better with a slightly sagging battery. The first two outputs also each feed a pair of sockets so you can power two extra pedals, though note that these socket pairs are in parallel, not isolated. With most low–current analogue pedals this isn’t a problem. Output five is again 9.6V but offers a higher current capability of 350mA (all the previous outputs are rated at 100mA). Outputs six, seven and eight are adjustable from 9.6 to 12 V (250mA), while output nine can be adjusted from 18 to 24 V (150mA), this time via an internal trimmer. My only challenge was that I needed a centre-positive 12V feed for one of my pedals. Thankfully, as all the Oktopus Plus outputs are fully isolated, all I had to do was make a crossover cable for that particular pedal. An internal switch or jumper to achieve this on one or two of the outputs might have been preferable but it certainly wasn’t an insurmountable a problem. After hooking up all my pedals, I switched on and there was no more hum, whine or buzz other than that coming from my guitar pickups. The improvement was dramatic — and that’s about all that needs to be said, other than that my pedalboard is now also smaller, as I no longer have any need for the extra PSUs or mains distribution strips I mentioned earlier. Good pedals aren’t cheap and while PSUs aren’t particularly glamorous, it doesn’t really make sense to skimp on them, especially as many of the budget units claiming to offer isolated outputs in fact don’t.